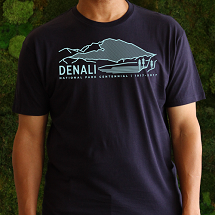 This Grand Canyon T-Shirt commemorates the centennial of America's 15th National Park. The Grand Canyon is often considered one of the Wonders of the World. From Anonymous of Los Angeles, California on 12/24/2018 . I got this beautiful shirt for free when I joined Sierra Club. It runs a tiny bit large. The cotton is very fine. This will be a perfect summer shirt! !